A few weeks ago I was pleasantly surprised to receive a box of goodies from my favorite bento supply store, BentoUSA. I received a set of fun CuteZCute vegetable cutters which could create 6 fun shapes; flower, house, mustache, hat, animal face and butterfly. Although it is named vegetable cutter, you can also use them to cut cheese, bread, tortilla, cookies and more. I used the flower cutter for the apples, hat cutter for the bear and animal face cutter (looks like a bear to me) for the cucumber slices. I used my CuteZCute cuddle palz sandwich cutter for the bear, which, with the organic grape jam filling, gives a sort of Linzer cookie effect.This lunch was packed in a Planetbox Rover. Main compartment - Organic grape jam sandwiches with a cute cheddar cheese hat. Upper left -Apple slices with flower cutout. Center - A slice of cucumber with bear cutout. Upper right -Seedless black grapes with a bear pick. Adorable lunch! I just placed an order for the vegetable cutters & I can't wait to get them!!! Jessica, thank you and I hope that you'll enjoy the cutters as much as we do! wow! you are fast :) those vegetable cutters are cute! 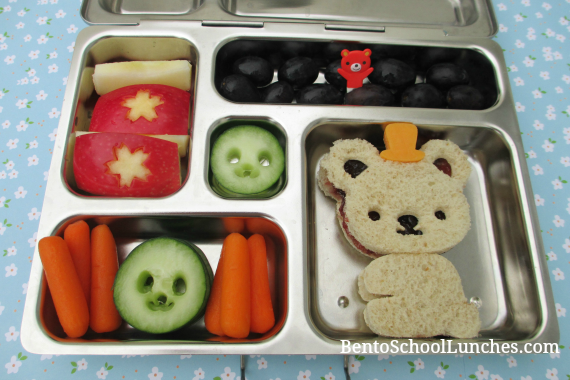 Adorable bento! Must go check out those cutters you mentioned!